The History channel will air a documentary this Sunday, which it claims will change history. The show, “Amelia Earhart: The Lost Evidence,” airs at 9 p.m. on Sunday, July 9. The two-hour special focuses on the mysterious fate of pioneer female aviator Amelia Earhart and her navigator Fred Noonan, who disappeared on an around-the-world flight in 1937. Earhart and Noonan were on the final leg of a 29,000-mile journey when their plane disappeared somewhere over the Pacific. As soon as she was reported overdue, people started inventing theories about where she was and what had happened. Some of these theories incorporated facts; others were more fanciful. Since there was no evidence to support any theory, the evidence supported any theory. The most widely accepted course of events involved the pair losing their way over the ocean, running out of fuel, and crash-landing in the water. The plane would have sank, leaving no trace, and the two aviators would have followed it down eventually. The History channel claims to have been presented with some actual evidence it thinks proves that Earhart and Noonan survived whatever happened to their plane. If it is right, this would indeed change history—or actually, write as history what had previously only been speculation. The theory being promoted by former FBI Executive Assistant Director Shawn Henry is that Earhart and Noonan were captured by Japanese forces, which controlled much of the Pacific at that time. He speculates that the pair died in Japanese custody. Henry bases his theory on a black-and-white photograph found by former Treasury agent Les Kinney in declassified National Archive records in 2012. 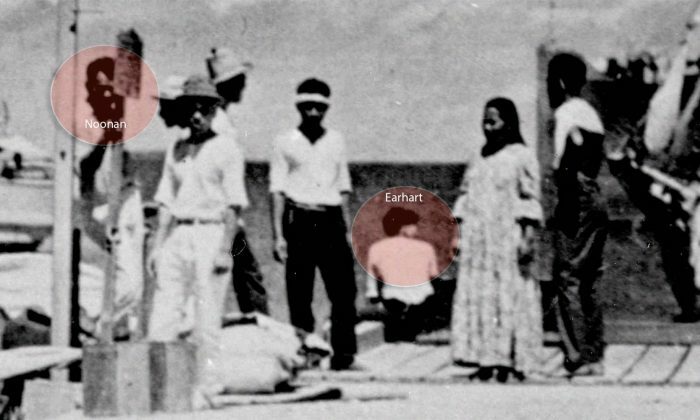 Kinney believes the photo was taken before 1943, and shows Earhart and Noonan on a dock on a Marshall Islands atoll. A ship in the photo is towing a barge, which photo interpretation experts have determined to be the size of the plane Earhart and Noonan were flying— a 38-foot Lockheed Model 10 Electra. Further photo analysis seems to indicate that on the extreme left of the photo, amid a group of islanders, stands a Caucasian man with a prominent nose and a sharply receding hairline. Facial recognition software and analysis seem to indicate that this could well be Fred Noonan, said facial recognition expert Kent Gibson. The photo also shows what could be a short-haired Caucasian woman sitting with her back to the camera, looking at the object on the barge. Gibson analyzed the figure’s physical proportions and compared them to existing photos of Earhart. The idea that Earhart and Noonan had been captured by the Japanese has been floated around since the 1960s but no contemporary records from Japan survived the end of the war. Henry believes that the Japanese would have assumed that the two American aviators were spies, which would explain why they would have been incarcerated. After the war, there was nothing for the Japanese government to gain by revealing that they had captured and killed the much beloved Amelia Earhart almost by accident by leaving her locked in a cell on a Pacific atoll. How well the evidence actually supports the series can only be determined on way—by tuning in to watch the program.